Bravery is a very high character that only few men possess. It is the act of facing the toughest of challenges, knowing the consequences of their actions. Acts of bravery can be anything, ranging from facing the war front, fire fighting, getting into trouble for the sake of others and your own self and so on. One ancient Greek philosophy clearly defines the act of bravery as “the people who certainly have the clearest vision of what is before them, glory and danger alike and yet notwithstanding, go out to meet it.” Bravery has been in the blood of royal people as well as common man and there is no evidence that there was a respite to it. Bravery should be in the mind and body till the last minute possible and as El Cordobes says, “Bravery is the capacity to perform properly even when scared half to death”. 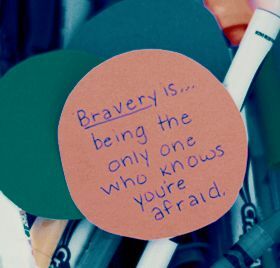 Share these quotes on bravery to your friends through email or ecard.